Open the eyes of thy church, O Lord, to the plight of the poor and neglected, the homeless and destitute, the old and the sick, or the lonely and those who have none to care for them. Give unto us the vision and compassion with which thou didst so richly endow thy servant William Augustus Muhlenberg, that we may labor tirelessly to heal those who are broken in body or spirit, and to turn their sorrow into joy; through Jesus Christ our Lord, who liveth and reigneth with thee and the Holy Ghost, one God, for ever and ever. Amen. Open the eyes of your church, O Lord, to the plight of the poor and the lonely, the homeless and destitute, the old and the sick, or the lonely and those who have none to care for them. Give to us the vision and compassion with which you so richly endowed your servant William Augustus Muhlenberg, that we may labor tirelessly to heal those who are broken in body or spirit, and to turn their sorrow into joy; through Jesus Christ our Lord, who lives and reigns with you and the Holy Spirit, one God, for ever and ever. Amen. This commemoration was separated from that of Anne Ayers and appears in Lesser Feasts & Fasts 2018 with revised lessons & collects. 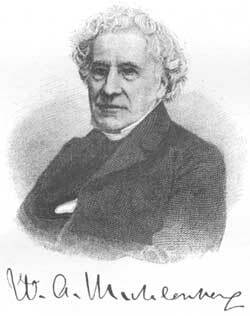 William A. Muhlenberg was born in Philadelphia on 16 September 1796, to a distinguished German Lutheran family. Attracted to the Episcopal Church by its use of English, he was ordained in 1817. He was active in promoting the Sunday School movement, and concerned that the Church should minister to all social groups. He wrote hymns and compiled hymnals, greatly expanding the range of music in Episcopal churches. In 1828 he founded, and for twenty years headed, Flushing Institute (later St Paul's College), a boys' school in Flushing, New York. There he made extensive use of music, flowers, vestments, and an emphasis on the Church year and on sacramental worship, with the weekly reception of the sacrament of Holy Communion, while at the same time preaching with great force and conviction the Reformation doctrines of grace and of justification by faith. Out of his ministry came inspiration for the establishment of Church schools and hospitals, and an outreach to the poor. In 1846 he founded the Church of the Holy Communion in New York City, with a parish school, a parish unemployment fund, and trips to the country for poor city children. He called himself an "Evangelical Catholic," and by his firm stand for Evangelical Faith, Apostolic Order, and Corporal Works of Mercy, he spoke to all parties in the Church while belonging to none. As one writer has said, "There was not a significant area of the Church's life, during his ministry, that he did not elevate and strengthen by the pureness of his life and the vigor of his consecrated imagination."